Description:This is where Johann Sebastian Bach married Maria Barbara Bach on October 17, 1707. He was 22 and she was 23. The church is located in Dornheim, a village outside of Arnstadt. 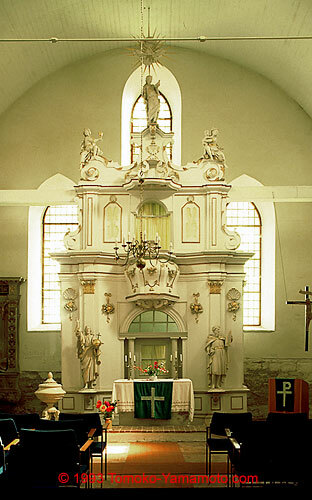 The altar is a Flügelaltar (winged altar) in the late Gothic period in the first half of the fifteenth century. There are statues of five figures attached to the altar. It looks like the top three figures are female, one of whom holds a child. The male figures close to the floor level might be apostles. One of them could be St. Bartholomew.